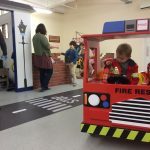 We were excited to be invited along for a special preview for bloggers at Little Street’s newest play centre in Maidstone, Kent. I’ll admit I’m not a fan of soft play. 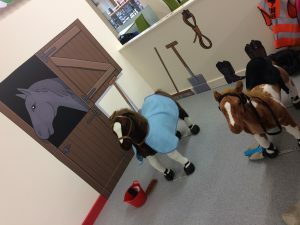 I was really intrigued to visit Little Street – the website describes it as a centre for imagination and role play and different to any other play centre experience. Responding to children’s love of role play, we have created a realistic street designed with little people in mind. 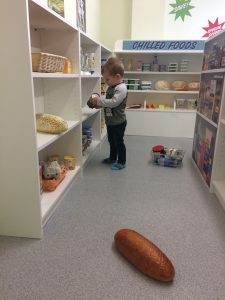 Our play centres feature a supermarket, construction site, police station, theatre, medical centre and more; Little Street is a scaled down version of a typical town, inspiring children to explore life in the world around them. Little Street is situated within the Royal Star Arcade in Maidstone Town Centre, and is on the first floor, with access by stairs and lift. We arrived at 11.30am and were greeted by the friendly and helpful staff, including Hannah, one half of the husband and wife team behind the concept. 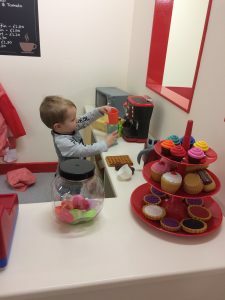 There was a lovely buzz about the place, and staff, parents and children were equally excited to be trying it out. There were a few rules – no food, drink or shoes in the play areas, socks must be worn, and no buggies. 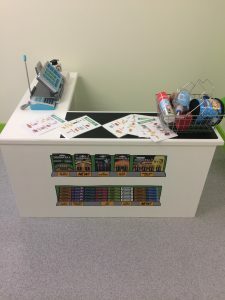 A secure buggy park was situated in view of the reception area. 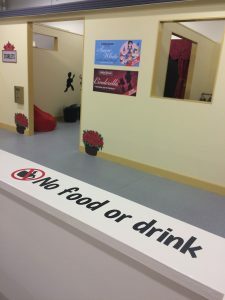 There is a café area to the right as you walk in, where you can leave your personal items and shoes and it is safe and secure, plus you can easily see the play area over a low dividing wall. The mancub ran straight for the toy Ferrari(expensive taste, what a lad); and other vehicles he could wheel around in. 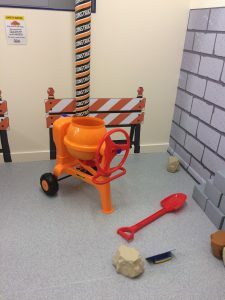 Next we checked out the construction area – complete with foam bricks and rocks, ride-on diggers and a working cement mixer. 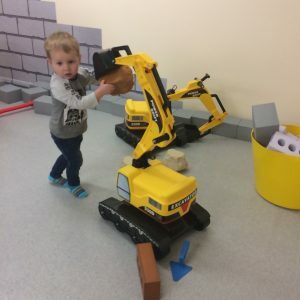 He loved it in there and it was great watching him create a mini building site for himself and moving the rocks with the diggers. 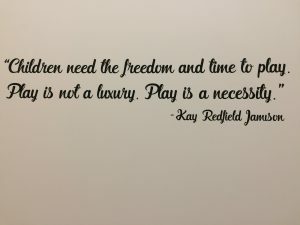 There is a huge baby change and toilet which had plenty of space and play-related quotes on the walls – a lovely touch. We then wrecked visited the supermarket and this was a huge hit with the small one. I loved the detail in this room, as I did all of them to be honest – the shelves were stacked with actual size fruit, vegetables, and household bottles and containers that were washed out real life versions. 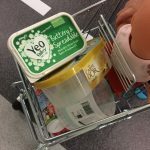 The little man loved wheeling the dolly around in the trolley, and then scanning his shopping. He seemed to find his soulmate in the form of a plastic loaf of bread; he kept cuddling and kissing it and wheeled it around in his trolley instead of poor dolly who unfortunately got run over. “Ahhh baby bread mummy, the mancub love baby bread”. While he was in there I checked out the doctor’s surgery and school/learning room; again, could not fault – lots of happy children and lots of great ideas to stimulate the imagination of little ones. 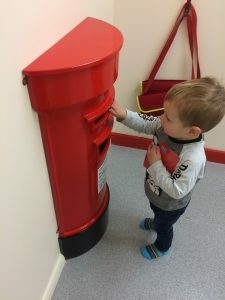 Each room has its own post box outside and you can collect the mail and take it to the post box – the mancub loves Postman Pat and loved playing postman. The little stables were super cute, not up my little ones street(terrible pun, sorry) but we had a little mooch nonetheless. Off he went, pretend-blending plastic ham, cutlery and other random concoctions, singing happily and pretending to cook. 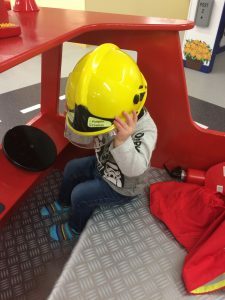 He loved dressing up and playing on the fire engine – I was so impressed to see him find a green and red paddle, and position it on the top – “nee-naw light mummy”. There was a dressing up, police station, cinema and music/stage room, we didn’t venture in as I couldn’t prise the small one away from the cars at that point. Sessions last 90 minutes and when it came to home time, he REALLY didn’t want to leave. He screamed the place down in his typical two-year-old manner. RIP my right eardrum. 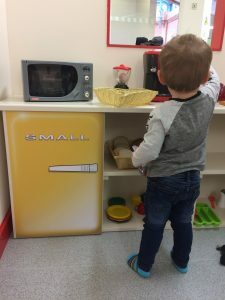 We finished with a juice(coffee for mummy) and a flapjack, and chilled out and chatted with other mums, dads, and staff before heading home for a rest. 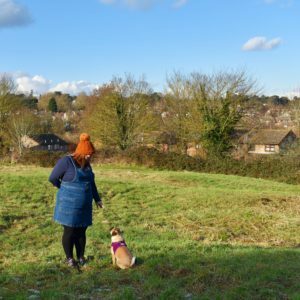 It was lovely to meet some other bloggers and put some names to faces. Normally when we visit soft play centres I usually leave depressed, stressed, dying inside, sobbing, angry and completely shattered. This was the total opposite, a lovely experience from start to finish. 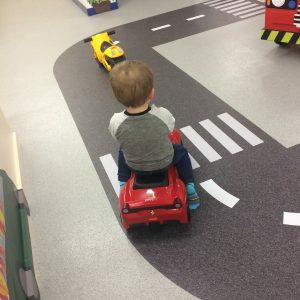 So how is Little Street unique to other play centres? There is no ball pit. No scummy slides. No climbing frames. No hoards of children smacked off their t*ts on artificial flavours. 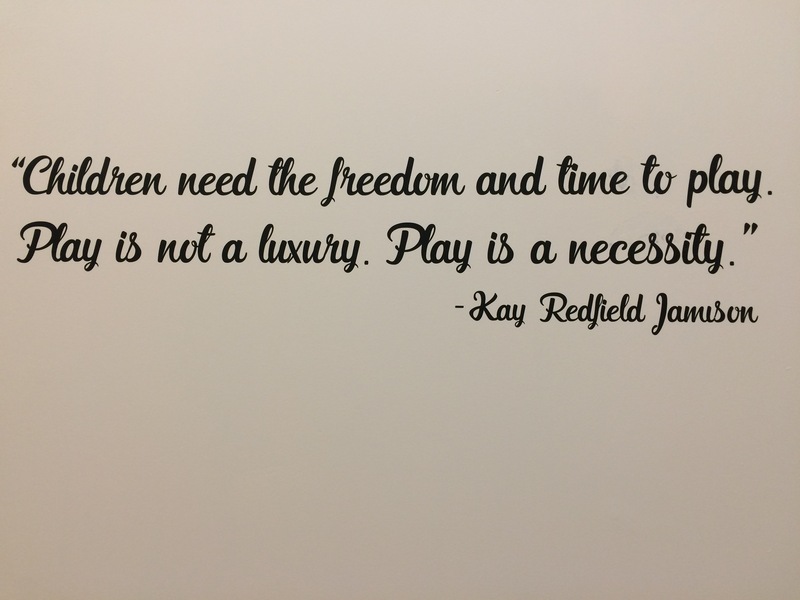 It’s all about role play, imagination, and education through play. It’s a wonderful concept and great fun; parents are encouraged to join in and it is great fun. 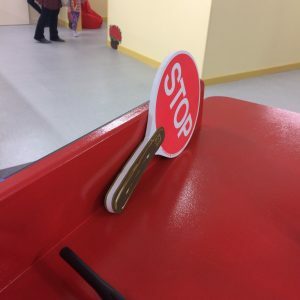 The staff really care. They could not have been more informative and helpful.. Little Street is their baby and they want you to get the very best out of it. They are passionate about what they are doing and it is lovely to see and experience. It’s all on one level. There are no steps, climbing frames, slides – so you don’t have to do that frantic Tarzanesque climb to fetch your crying child from the top of the slide. Attention to detail. They have thought of everything; the detail is awesome. The checkout has scales and a scanner. The café has a cake stand, the tables have plastic tablecloths. The play food is actual size and is well made and not just plastic tat. The rules. I love the rules; they are simple and clear. 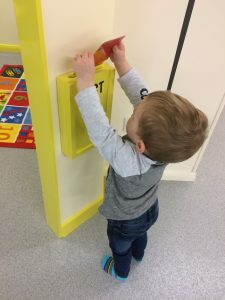 It shows respect for the play centre and shows how much care and love went into creating such a safe and pleasant environment. Order and cleanliness. The place is kept in check by a member of staff on rotation between each of the rooms, tidying and clearing up. 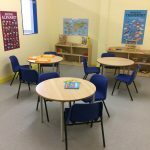 The centre operates four 90 minute sessions a day, seven days a week and closes completely for 30 minutes between each session for cleaning. No nasty scummy plasters floating around or suspicious looking marks on the walls. Annual Passes & Childminder rates are also available. You can book online and do so right up to the session, meaning if you are nearby and decide you want to visit, you can. 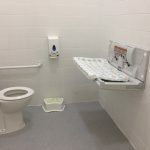 I’ve had a little go at booking online and it’s really clear and simple to use. 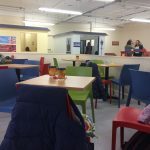 There is a small café offering hot drink and healthy snacks, and it is really reasonably priced. You can sit and play Candy Crush work and easily keep an eye on your little one(s) if need be but you wouldn’t want to, it’s so much fun playing with your small person/people. So I would say Little Street is perfect for us – the mancub is of an age where he needs interaction with other children and we are not in a position to be able to send him to nursery or preschool at present; so this concept of learning through play may well be a blessing in disguise and I’m hoping regular visits will be the hubseficial in many ways. I could not find fault, I was blown away and we cannot wait to visit again. Little Street is open from 27th March 2017 – book now!